Hey @new_members @informed_members @Certified_Educators ! We hope you all are having a great start to the week. 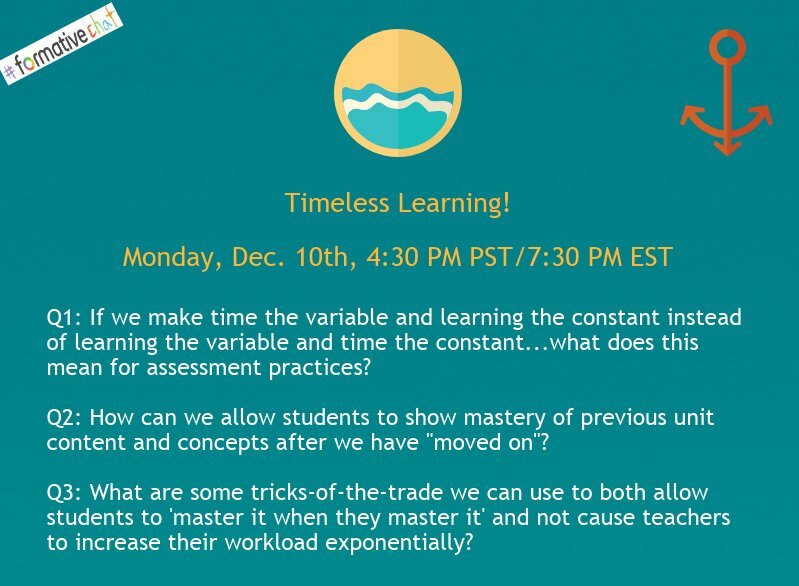 If you have time later today, we invite you to join our #formativechat on Twitter at 4:30PM PST / 7:30PM EST! 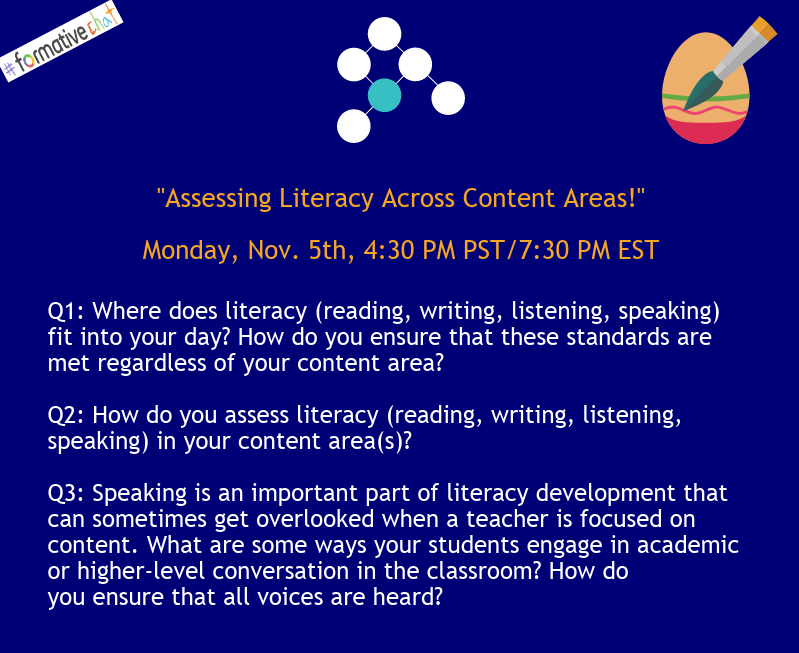 Kristi Daws is guest hosting and we’d love to hear how you are amplifying student voice within the learning process! If you’ve never joined us before, here’s how you can participate! We’ll post the questions in the #specialized-application category throughout the week so if you are unable to join us live, you can engage later! Q1 is now up in the community! How can you employ student voice to help students learn key vocabulary? Q2 is now up! 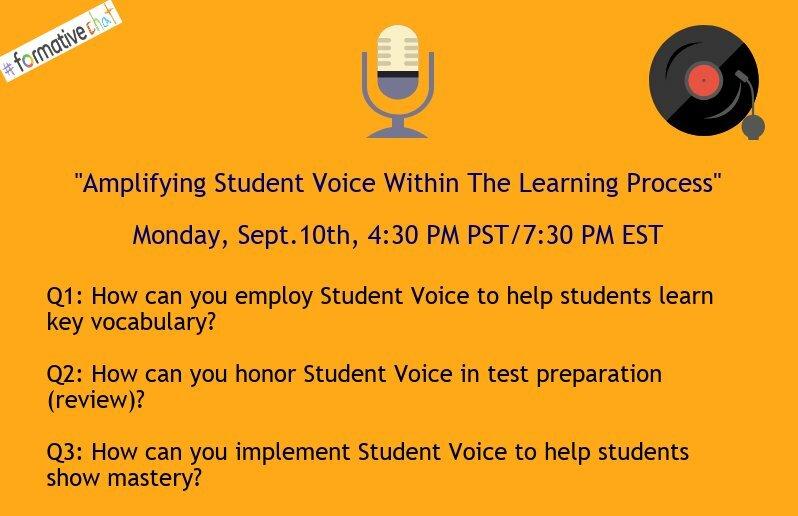 How can we honor student voice in test preparation(review)? On Monday, we are going to be kicking off another week-long slow chat about using Formative in the classroom this school year. 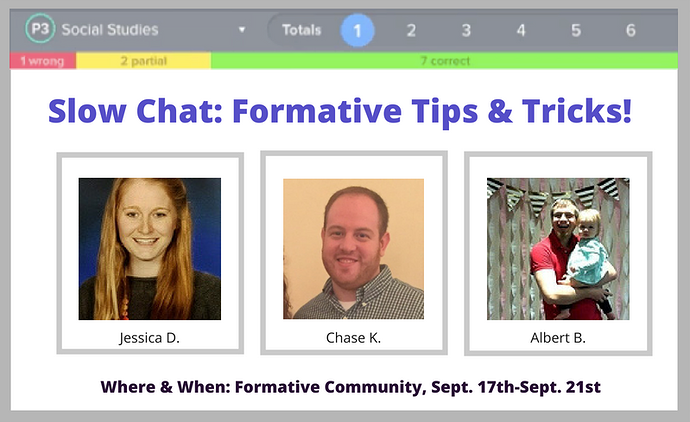 Formative Certified Educators @albertbryant ,@chase.kirkpatrick & @jdunn will be hosting and have put together some great questions for Formative users of all experience levels! They’ll be posting one question each day of the week in the #specialized-application category! We hope you can join us to share your implementation ideas, tips, and tricks! Q1 via @albertbryant! What are some best practices that you have for using Formative to start your school year off right? Q2 via @albertbryant! How do you use Formative to assess student levels before content is taught? Q3 via @albertbryant! How do you set up students in Formative? What methods do you use to make sure all students are in the correct class and what are your experiences with signup? Q5 via @chase.kirkpatrick What features of formative do you teach students to use first? Happy Friday everyone! I just wanted to give you a heads up that on Monday, Amy Storer will be hosting our weekly #formativechat at 4:30 PM PST / 6:30PM CST / 7:30PM EST. This time, we’ll be discussing the idea of branching out from traditional PD’s to find professional learning in new places that are more catered to our needs as educators (Ex: our Community Center ). We hope you can join us! Speaking of awesome professional learning, have you heard about our FREE, virtual summit coming up…#FormativeSummit (October 19th-27th)? It’s going to be a great way to learn innovative teaching ideas from thought leaders in education…at your own pace! 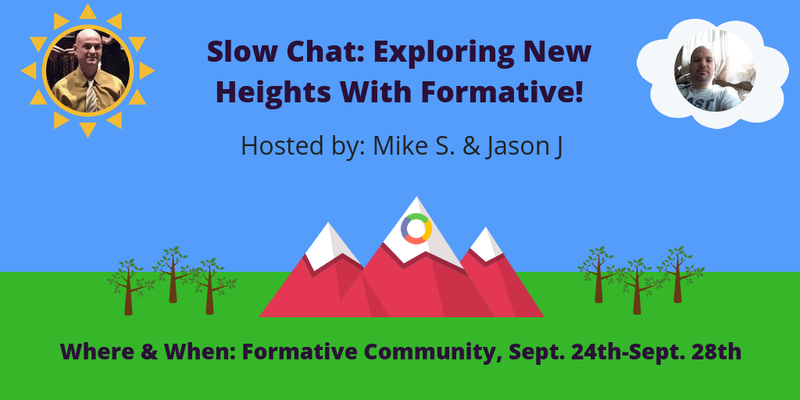 Starting tomorrow, @mszczepanik and @Jason_Jorgensen will be hosting a week-long slowchat about exploring new heights with Formative this year! Each day, they’ll be posting a question in the #specialized-application category for all of us to engage in! We hope you can join us for this awesome discussion! Q1 via @mszczepanik! How do you use Formative to build class culture early in the school year? Q2 via @mszczepanik! What are some of your favorite uses of Formative? Q3 via @mszczepanik! How has Formative moved your thinking from “traditional” classroom practices to innovative classroom practices? Q4 via @Jason_Jorgensen! How do you make it so that your formatives are more than just a substitution and move up to augmentation, modification, or redefinition according to the SAMR model? Q5 via @mszczepanik! How do you use Formative to Differentiate your instruction? In celebration of our upcoming FREE, virtual edu conference…#FormativeSummit, we’ve invited one of our speakers, Dean Deaver, to guest host #formativechat tomorrow! 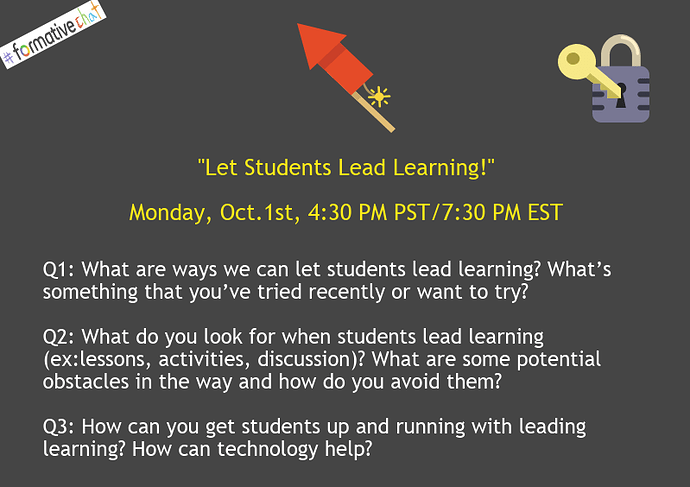 We are going to be discussing opportunities to let student lead learning and would love to hear your thoughts! Haven’t signed up for #FormativeSummit yet? Don’t wait till it’s too late Sign up here! Q1 is up! What are ways we can let students lead learning? What’s something that you’ve tried recently or wanted to try? Q3 is up! How can you get students up and running with leading learning? How can technology help? 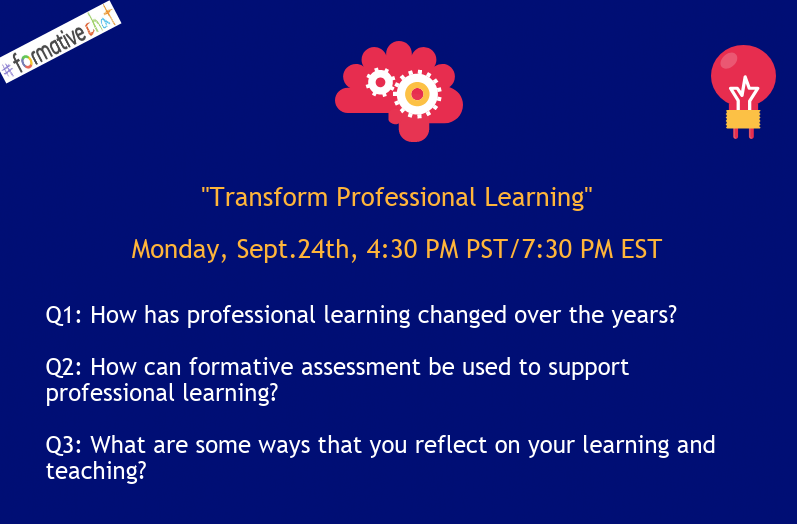 Join us on Monday for another fantastic #formativechat (4:30PM PST / 7:30PM EST)! This time, Dennis Griffin Jr will be leading a discussion about how we can take action when students aren’t learning. We hope you can join in and share your thoughts! Also…our FREE, virtual edu conference (#FormativeSummit) starts next Friday! If you haven’t signed up yet, you still have time bit.ly/formativesummit It only takes a moment and you’ll be unlocking a ton of great teaching ideas! Did I mention that it’s FREE? We hope you all are enjoying #FormativeSummit! We just wanted to give you a heads up that Paul Solarz is going to be hosting #formativechat tomorrow (4:30PM PST / 7:30PM EST)! 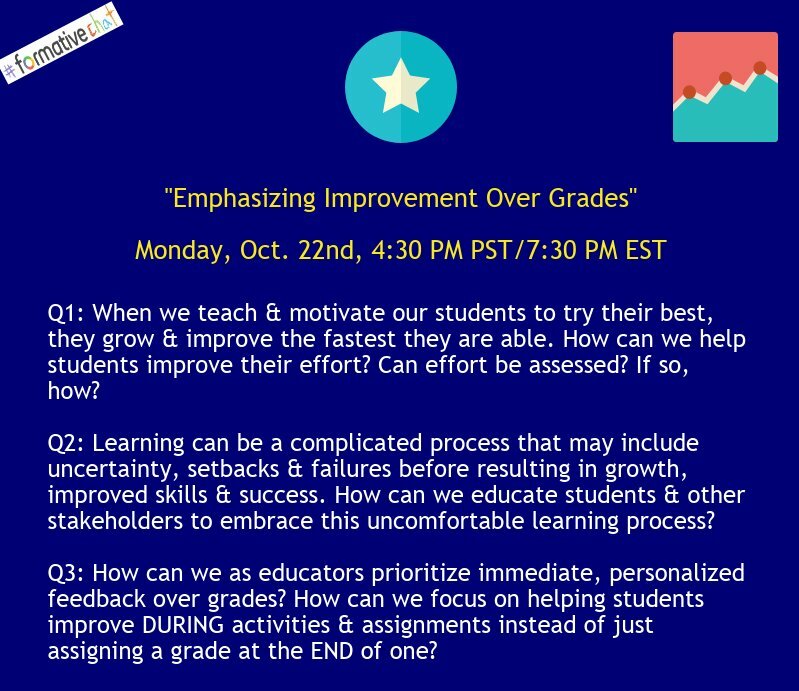 The topic of discussion is emphasizing improvement over grades! We’d love to see you there! We’ll post the questions in the #specialized-application category of our community throughout the week so if you are unable to join us live, you can engage later! Hey @new_members @informed_members @Certified_Educators ! In case you didn’t see, we’ve started to discuss all the amazing #FormativeSummit sessions and share our experiences regarding the range of topics focused on empowering learners! I’ve linked each discussion below so you can easily participate We’d love to hear from you! 1. How do you make the most of your minutes in class with students? 2. What’s one way you give students ownership over learning? 3. What’s one way you praise the process as opposed to the person? 4. How can you help students focus on improvement rather than grades? 5. How can we let students lead learning with tech? 6. How are you using tech to meet your student’s needs? 7. 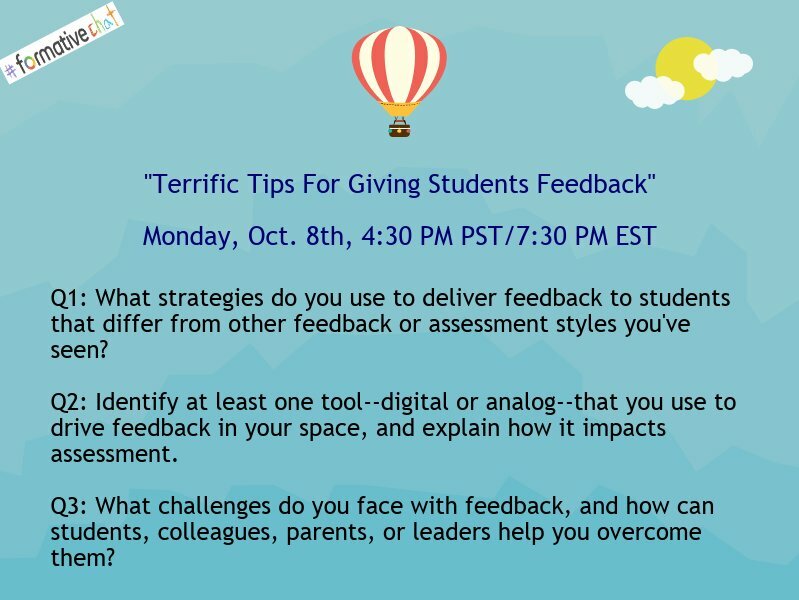 What methods do you use to give students meaningful feedback? 8. How can you create memorable learning experiences for your students? 9.What are your favorite ways to collaborate with other educators online? 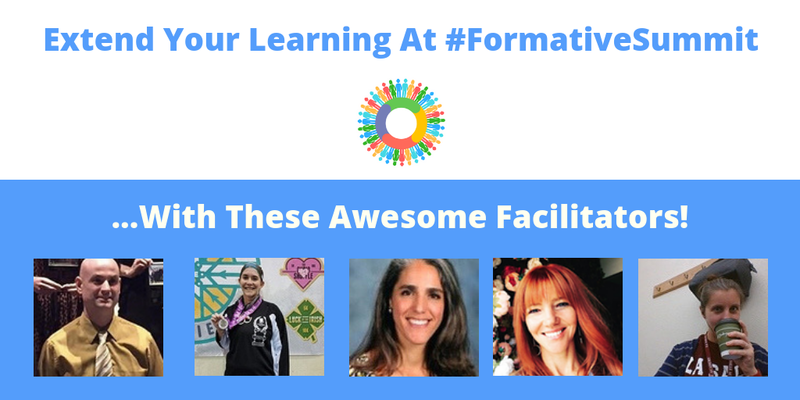 Also, shout-out to our amazing facilitators @enapolitano @lpereira @mgarcia @jillian.kostuchrzepk @mszczepanik If you haven’t heard the news yet, we have extended #FormativeSummit till November 5th so you can enjoy all the webinars till then! Sign up now and invite your colleagues so you have time to watch them before they are gone! Tomorrow we are back with another amazing #formativechat! Maureen Hayes is returning to guest host and the topic is assessing literacy (reading, writing, speaking, listening) across content areas. Don’t miss this important discussion! Join us tomorrow for #formativechat ! 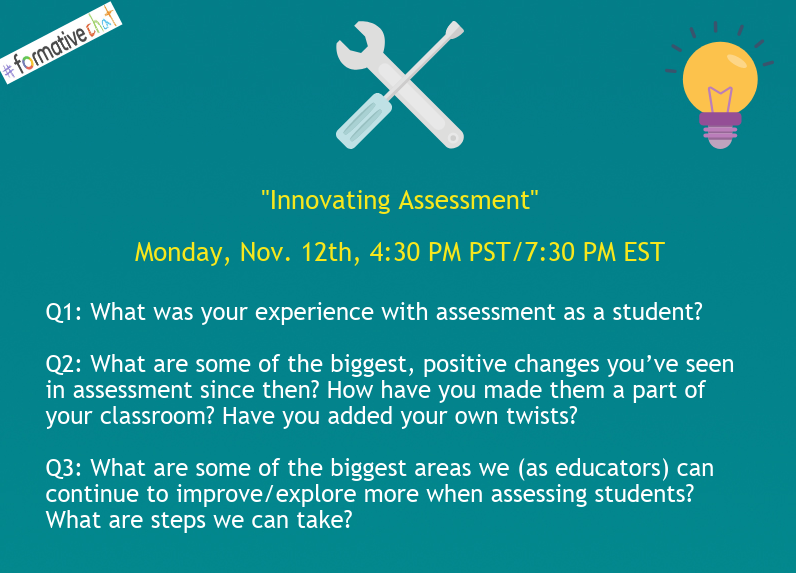 Rodney Turner is guest hosting and we are going to be reflecting on our respective experiences with assessment as students and how we can innovate it as educators! Q1 is up! What are some of the biggest, positive changes you’ve seen in assessment since you were a student? How have you made them a part of your classroom? Have you added your own twists? Q2 is here! What are some of the biggest areas we (as educators) can continue to improve/explore more when assessing students? What are steps we can take? 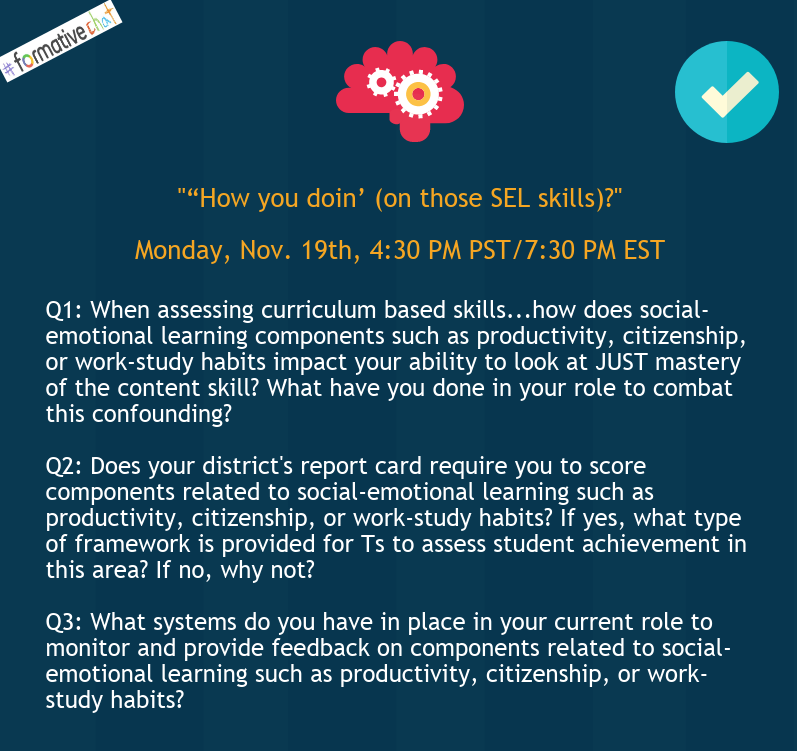 Q1 is now up: When assessing curriculum based skills, how do SEL components impact your ability to just look at mastery of content skills? What have you done to combat this confounding? We hope you all had a wonderful Thanksgiving! We’d love for you to join us at #formativechat tomorrow at 4:30PM PST / 7:30PM EST! Divergent EDU author Mandy Froehlich will be moderating our discussion! She’ll be inviting you all to share your ideas for diverging from what’s been done and creating new possibilities for student choice in assessment! Q1 is up! 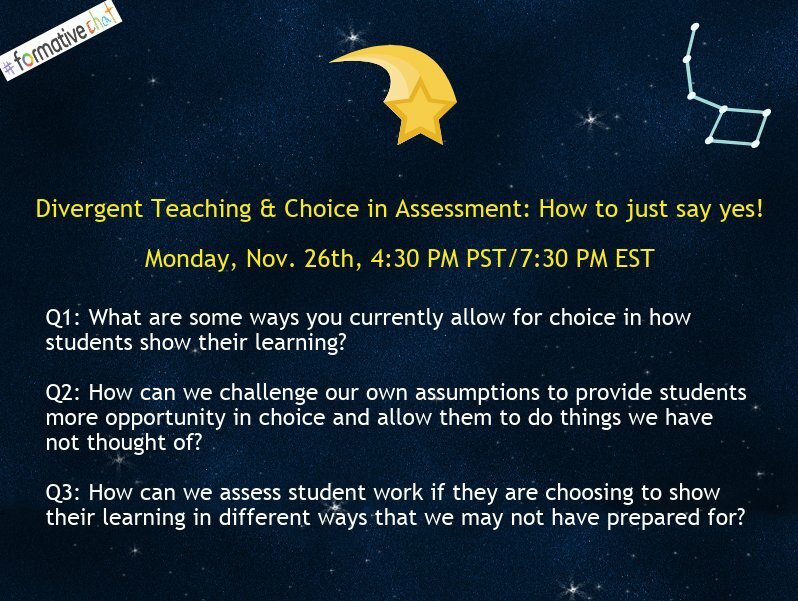 What are some ways you currently allow for choice in how students show their learning? Q2 is now here! How can we challenge our own assumptions to provide students more opportunity in choice and allow them to do things we have not thought of? Happy Formative Friday @new_members @informed_members @Certified_Educators! 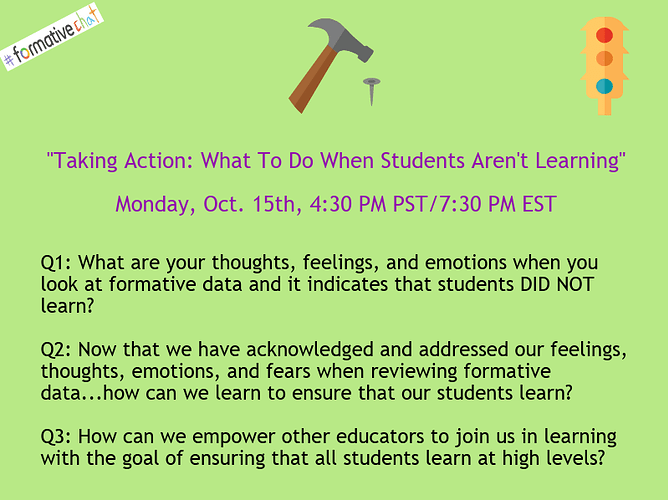 We’d love to invite you to join our upcoming #formativechat on Monday (4:30PM PST / 6:30PM CST / 7:30PM EST)! It’s 30 minutes of fast-paced discussion and great ideas! 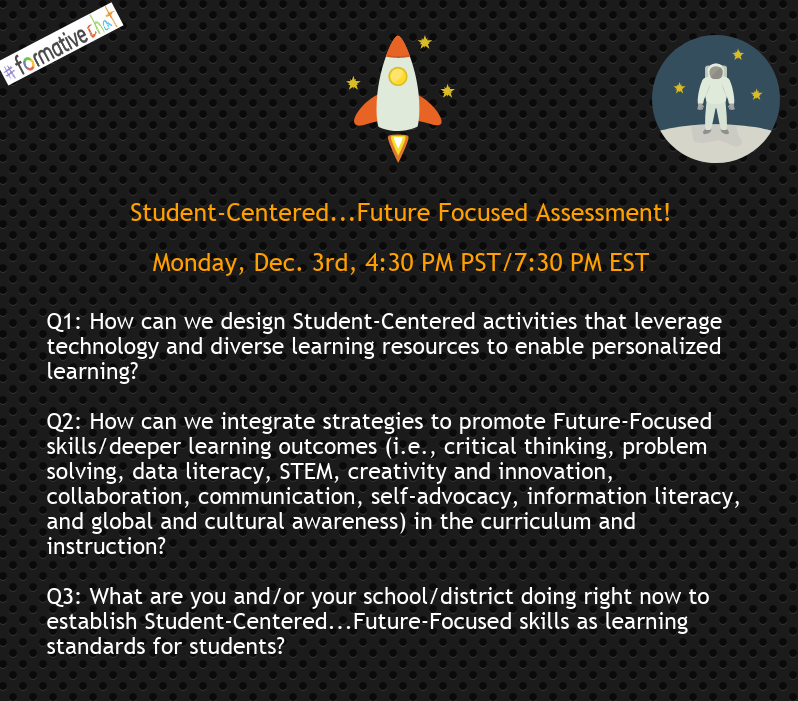 This time, we’ll be discussing ideas for using formative assessment to help students attain future-focused skills and personalize their learning experiences! 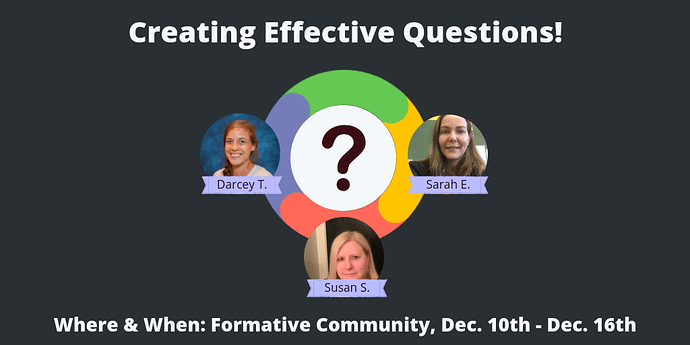 On Monday, we are going to be kicking off a week-long slow chat about creating effective questions! Formative Certified Educators @senger @Susan_Shires & @Darcey_Teasdale will be hosting and have put together a great set of questions for all of us to engage in that cover a range of different aspects of effective questioning (crafting the right Q’s for assessments, modifying the complexity of Q’s based on student readiness, teaching students to ask effective questions…)! This is going to be a great discussion so make sure to stay tuned to #specialized-application as they pose questions each day for you to engage in! Links to the questions will also be posted here as well! Q1 is up now via @Susan_Shires ! In considering the types of questions that you develop, how do you balance unit content with critical content questions? 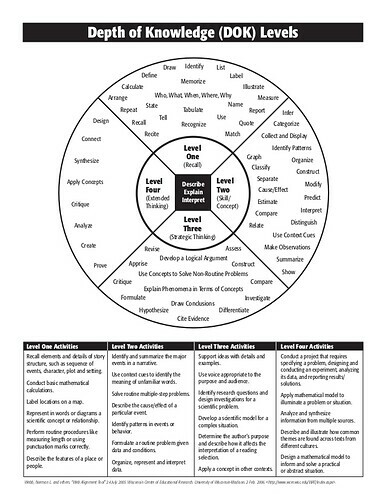 Within your assessments, do you work to create specific questions based on Webb’s DOK? Q2 is up via @Susan_Shires! Do you discuss higher order thinking questions- and their levels- with your students so that they can develop their own? Q3 is now here, via @senger Do you discuss higher order thinking questions- and their levels- with your students so that they can develop their own? Q4: Share some of your favorite/ most effective questions and why/what the result has been? Q5: Does the level of difficulty of your questions increase within a unit? Throughout the year? Why/why not? Q6: How do you prepare your students to answer questions collaboratively vs independently? Q7: How do you reflect on and evaluate the questions you ask? How often? P.S. 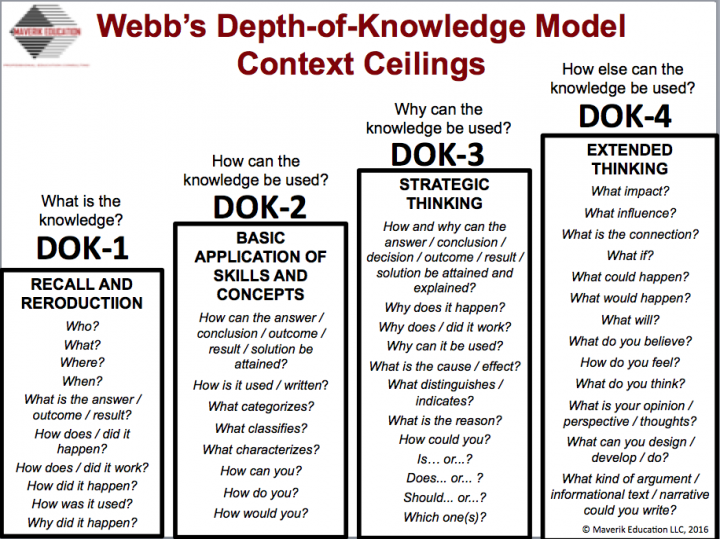 During the chat, we are going to be referring to Webb’s Depth of Knowledge (DOK) Levels! 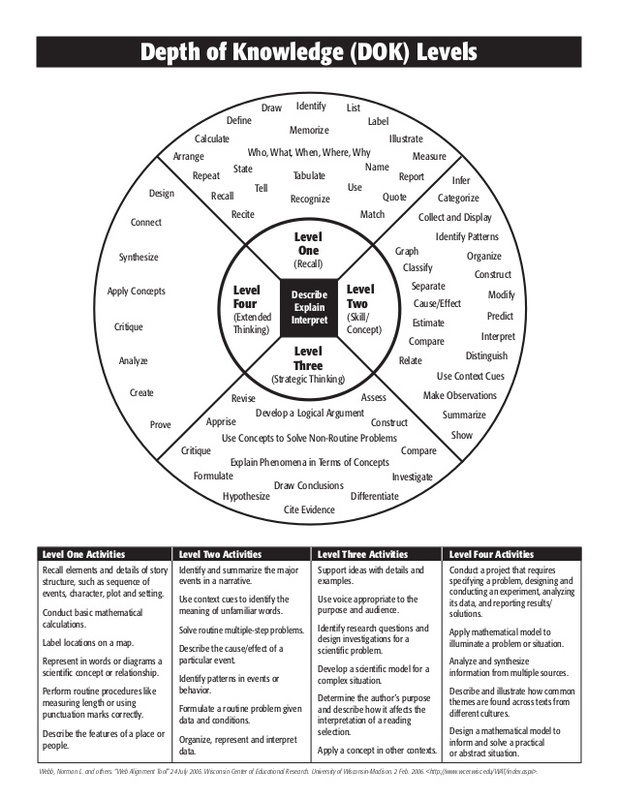 If you haven’t heard of DOK levels before, they are categories that describe the levels of thinking we can have student engage in. Below are different resources that our we (the hosts) have compiled to help you understand them! 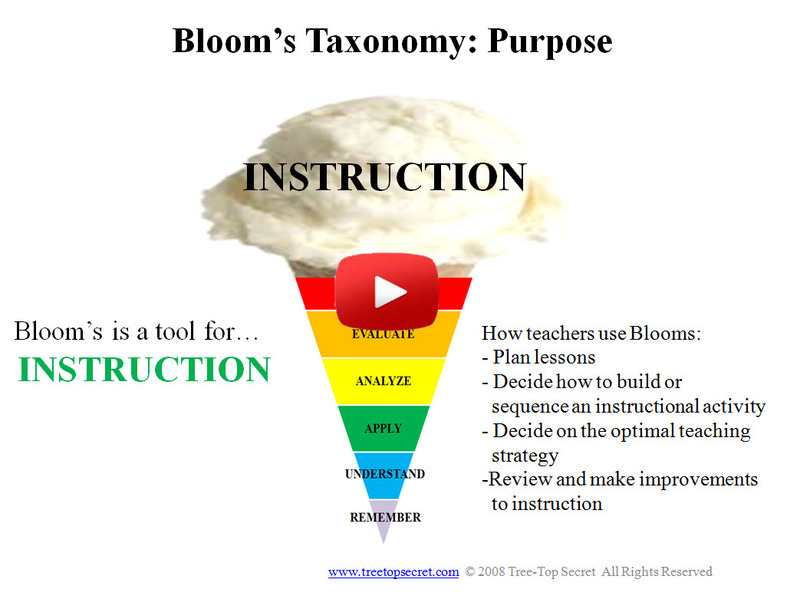 Bloom's Taxonomy and Webb's Depth of Knowledge DOK helps you with instruction and assessment. Take your students from lower order to higher order thinking. 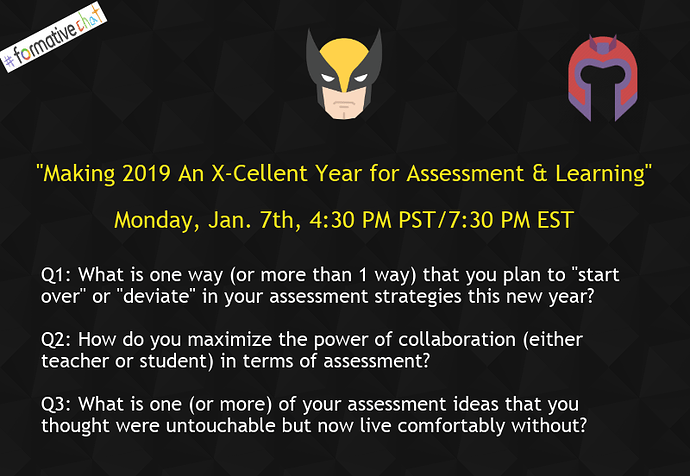 Also, join us on Monday for another awesome, #formativechat ! We are going to be talking about how time constraints affect assessment and how to support individual paces of learning! Matthew Larson is guest hosting! Join us on Monday for another awesome #formativechat on Twitter (4:30PM PST / 7:30 PM EST)! 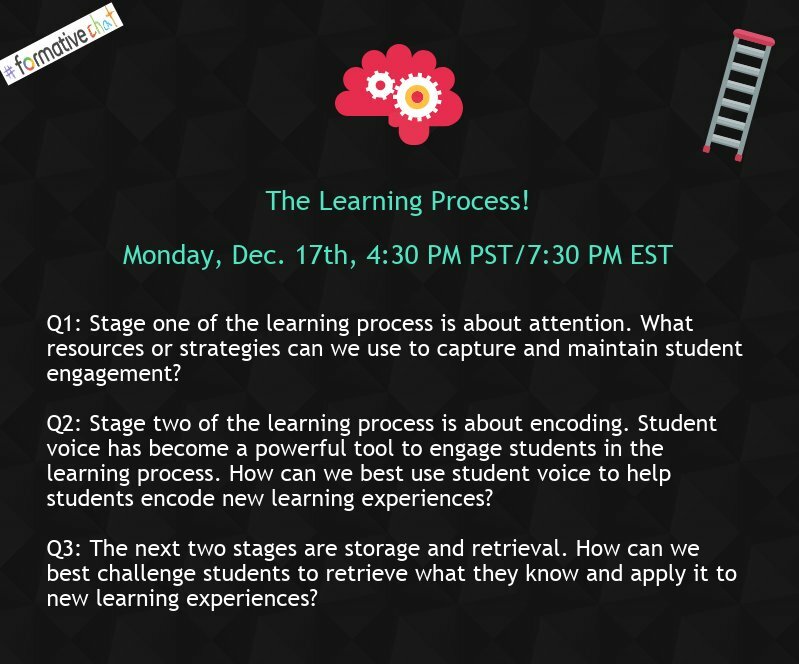 This time, we are going to be talking about how to help students make the most of each stage of the learning process (attention, encoding, storage, retrieval! Steve Wick is going to be guest hosting! #formativechat returns on Monday at 4:30PM PST / 7:30PM EST! 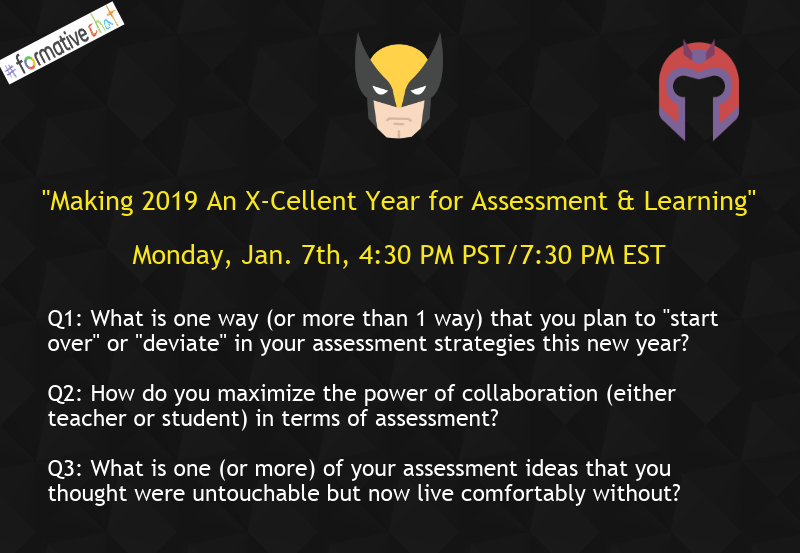 This time, we are having an X-Men themed discussion about making 2019 an X-Cellent year for assessment and learning! We hope you are able to make it! Our guest host, Laura Steinbrink, has created some really fun prompts to help contextualize our chat! What is 1 way you plan to “start over” or “deviate” in your assessment strategies this new year? How do you maximize the power of collaboration (either teacher or student) in terms of assessment? Join us later today for #formativechat (4:30PM PST / 7:30PM EST)! We’d love to hear how you are helping students reflect on their learning! Q1 is up for discussion! 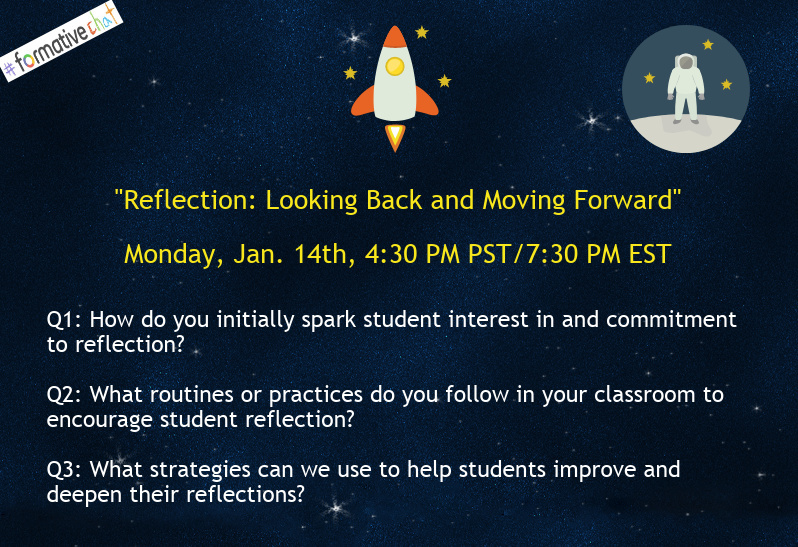 How do you initially spark student interest in and commitment to reflection? 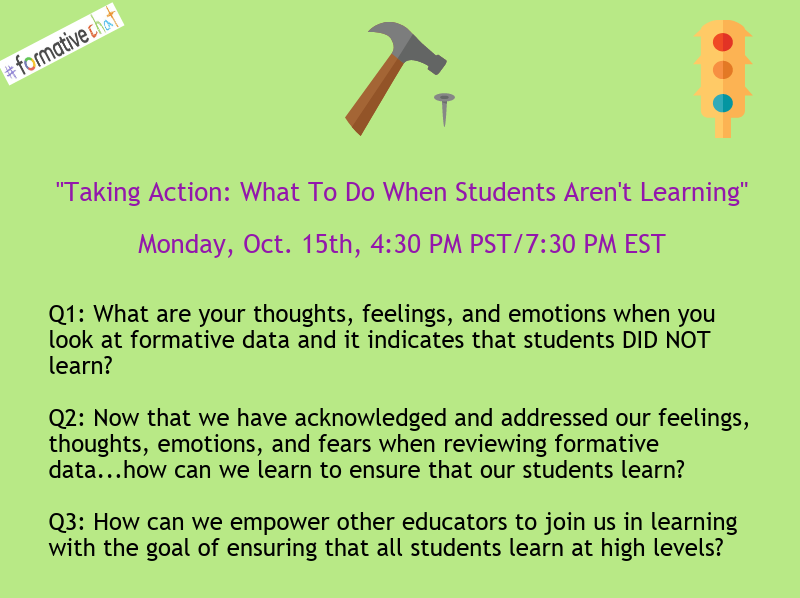 We hope you can join #formativechat on Monday (4:30PM PST / 7:30PM EST)! 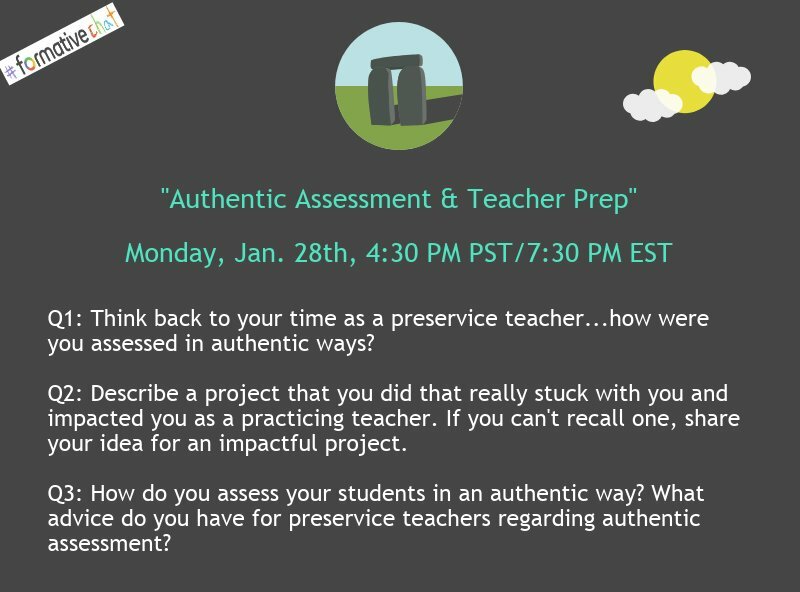 It’s going to be a great opportunity to share your experiences with authentic assessment and offer advice to others. It should be a great learning experience for both new and experienced educators!